No matter what you want to call this play in your terminology it is of the utmost importance the a playside (post-wheel) pass is utilized off triple option play action. I will not cover play action pass protection in this article. That’s the topic of another article due to the comprehensive nature of the protection that would overshadow the underlying purpose of the article. 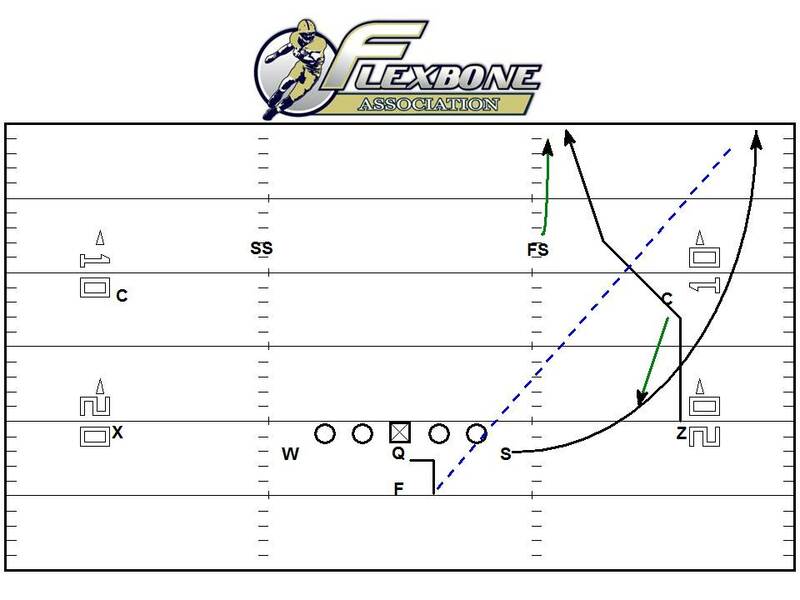 As stated numerous times the Flexbone Offense is a system based offense. The play action pass serves a purpose. The purpose of the play action pass is to counter the defense when the secondary players are playing the tackle on triple option, or perhaps on rocket toss. Remember rocket toss is to be used when a team is blitzing to stop inside veer. To run play action pass off of rocket action, they should both be blitzing (in order for you to need to run rocket) and playing very aggressive in the secondary against the run. I digress slightly but as it stands the purpose is to combat an overactive secondary, not because you have a hunch it will be there. To make your play action passes effective you have to make them look like how you block your run plays. An effective play action pass off of inside veer will mimic your perimeter blocking schemes on inside veer. If you recall the blocking rules for inside veer call for the PSWR, to block the near deep defender and for the PSA to block #3 in the option count. However there are cases where you will switch block the perimeter. The switch block look should be given by the A-Back on his release against a two high safety look no matter who #3 ends up being because the defense is not giving it away pre-snap. Thus the post-wheel concept is only effective against a two-high safety defense. Running it against a one-high defensive look is much less effective. Against a two-high look, the PSA will take his arc blocking path and search for the run support player (#3). He will key the corner first. Since the PSA will have his syes on the CB on the snap, whether it’s inside veer or play action pass, the defender will have no idea on the first few steps whether it’s a run or a pass. 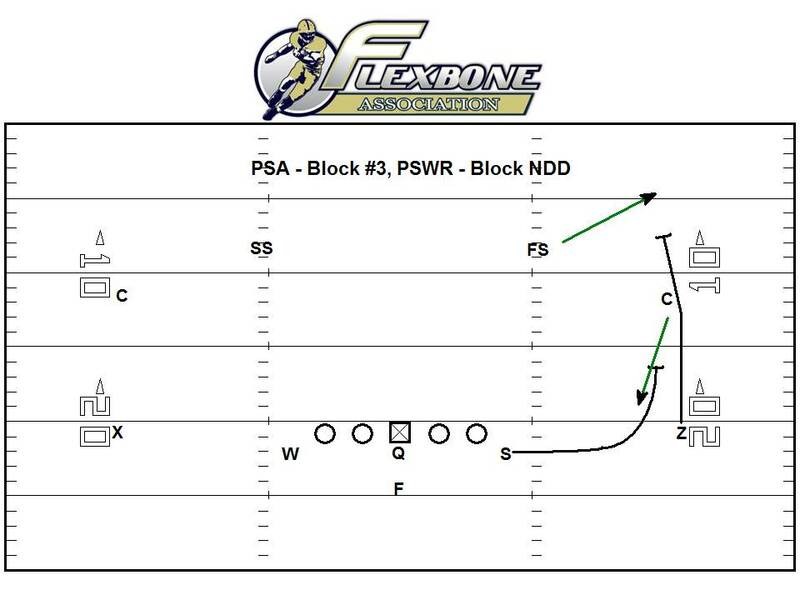 The perimeter blocking scheme on inside veer is shown below. The quarterbacks progression on this would be (Post-Wheel-Dig). I’ll write more on what to do on the backside in the future. The post will open quickest if the safety is careless. The wheel will come open if the corner is the aggressor in run support. If both of those receivers end up covered, the quarterback would come back to the middle and find the backside receiver running the dig. If that’s not there he must tuck the ball and run. In the above example the CB spun down as the run support player to take pitch. thus he should be blocked by the PSA on inside veer. If the safety would have filled the alley and become the run support player, the PSA would have blocked him and the PSWR would have simply run off the corner until he reacted to run. The natural extension of this scheme is the post-wheel combination. Against the same reaction by the defense the quarterback should throw the ball to the receiver would who be cutting underneath the safety trying to run over the top to cover the deep third. The post-wheel concept is more effective against a safety playing as #3, but the illustration shows the same concept. It is your responsibility as a coach to know which player should be open. Instruct your quarterback on what your coaches are seeing. It is your job to do so. The quarterback should have an idea pre-snap which player should be open, but needs to have the confidence to make the proper read in any case. If the safety spins down to take the pitch the quarterback knows he will have a two on one situation with the corner. If the corner runs with the post he will hit the wheel. Conversely if the corner retreats with the wheel, the ball will already be gone to the post. The last likely scenario is for both players to slow play or recognize the pass. If this happens we teach our receiver to carry the defenders deep. The A-Back will cut off his route if he knows he cannot beat the corner deep. This is part of the run and shoot system that we teach our players as well. We ask them to think and react to what the defense is doing. In this situation the quarterback will throw the ball to the A-Back in the flat. We want the quarterback to stay playside if he can. We only want to look for the dig on the backside as a last resort. If you run a number of play action passes and cant throw the ball to a playside receiver then you or your assistant coaches are not doing a good job of recognizing the stimuli for a pass to be called. Do you want to be one step ahead on Friday nights? Are you tired of substandard offensive performances? Contact the Scott Jazdzewski and the Flexbone Association to discuss how I can help your program take off. Below are examples illustrating the concept. 2. Assign an assistant coach (Receivers Coach) to notify you when the secondary is making tackles on triple option. 5. Run a complete concept to ensure you maximize your chance at success.